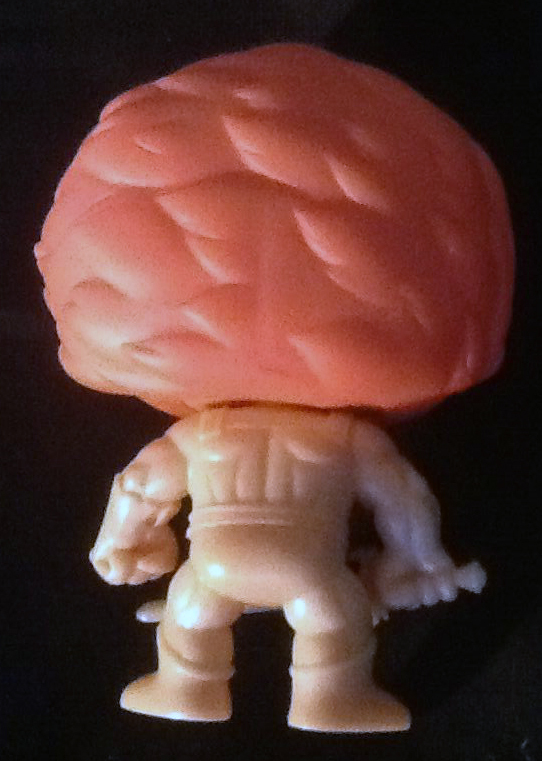 FUNKO is a purveyor of pop culture and licensed-focused collectibles company located in Everett, WA. It was founded as a bobblehead company in 1998 by Mike Becker. In 2005, Becker sold Funko to its current CEO, Brian Mariotti, who set his sights toward rapid growth in the licensed gift and collectibles world. Funko currently holds hundreds of licenses and the rights to create tens of thousands of characters – one of the largest portfolios in the pop culture and collectibles industry. Funko’s Pop! Vinyl is the number one stylized vinyl collectible on the market, selling millions of figures to collectors around the world. In 2013 FUNKO deceided to add our favorite felines to their awesome and very succesful line of chibi-style figures: POP! Vinyl. The FUNKO ThunderCats Series 1 figures have been released in the POP! Television series. 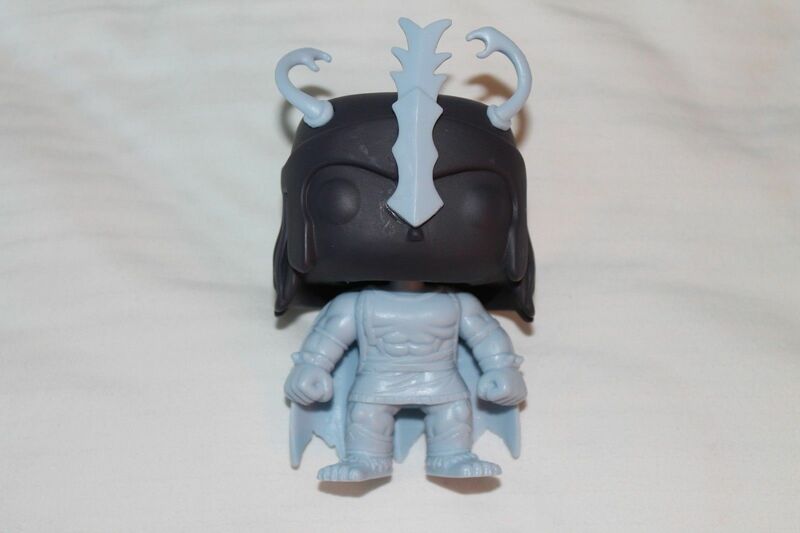 They also released two additional figures in the form of two SDCC Exclusives! 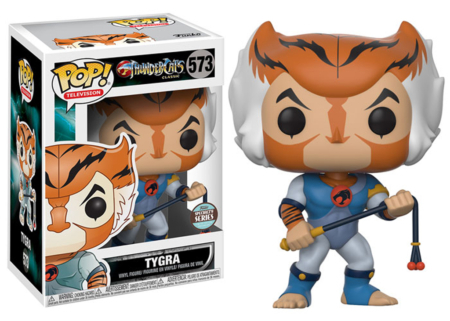 In 2017 Funko finally revealed Tygra, to be released in their Specialty Series Exclusive; you’ll only be able to find these exclusives in boutique retail, specialty stores, local comic book shops and from qualified online retailers. Also eBay. The Lord of the ThunderCats at his cutest! Lion-O wields the mighty Sword of Omens and his signature Claw shield. His outfit is very cartoon accurate in both sculpt and colour. 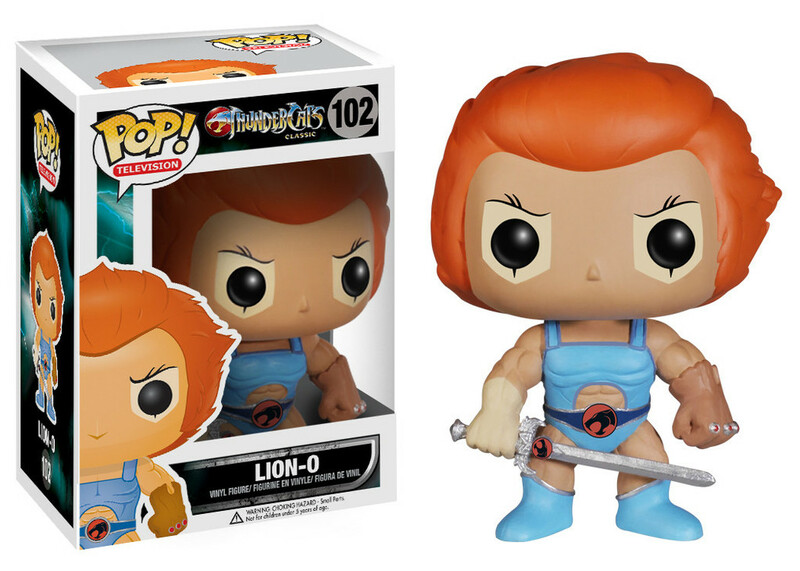 Lion-O, number 102 in the POP! Television line, stands an imposing 3.75 inches tall and comes packaged in a full colour, collector friendly window box. Arguably the most populair animated female of the 80’s, Cheetara is ready for battle with her signature magical staff and classic ThunderCats gear! Cheetara is the only figure that comes with a round, transparant, plastic stand, since her slim legs are no match for her oversized head. 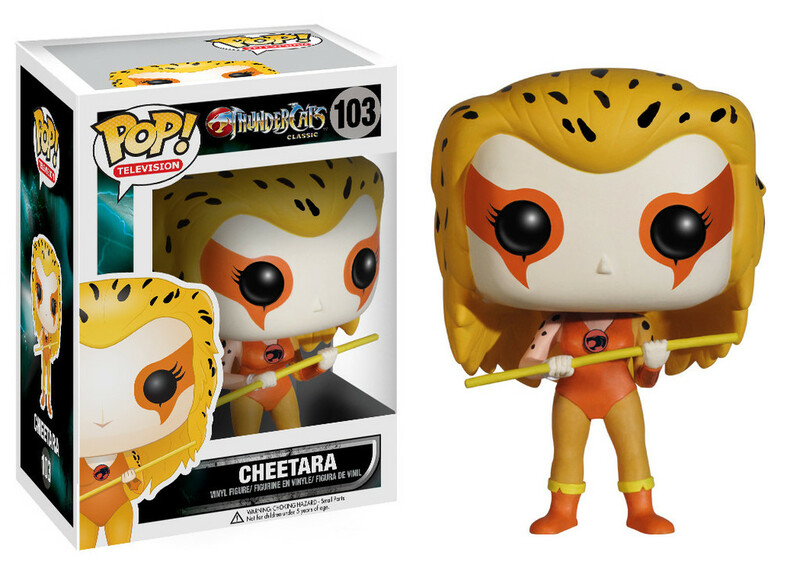 Cheetara is number 103 in the POP! Television line. She stands an imposing 3.75 inches tall and comes packaged in a full colour, collector friendly window box. The mechanic, engineer and resident strong guy of Cats’ Lair enters the world of POP! with muscles flexed and nunchucks at the ready. Though only 3.75 inches tall you don’t wanna mess with this guy! 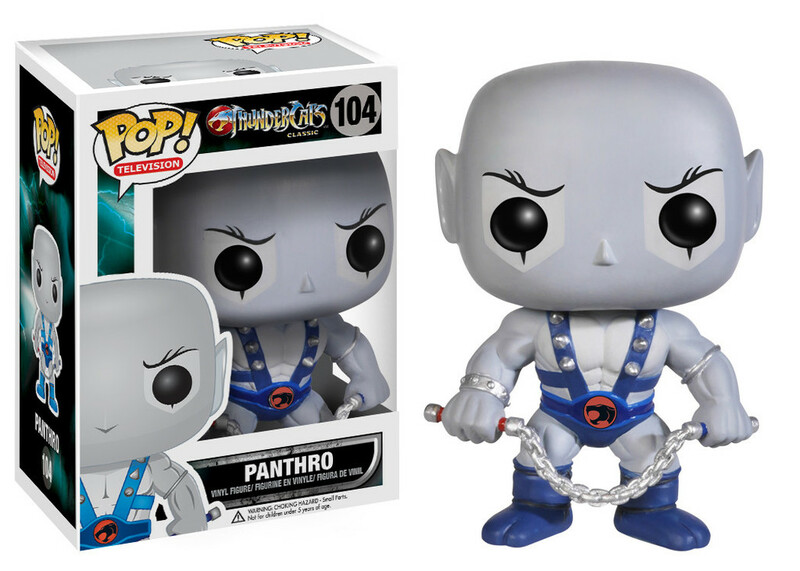 Panthro is number 104 in the POP! Television line. and comes packaged in a full colour, collector friendly window box. You wouldn’t think it lookin’ at this little guy, but this is the ageless devil priest himself; Mumm-Ra the Ever Living!! He looks really cool, sporting his classic headdress, cape and ripped bandages. 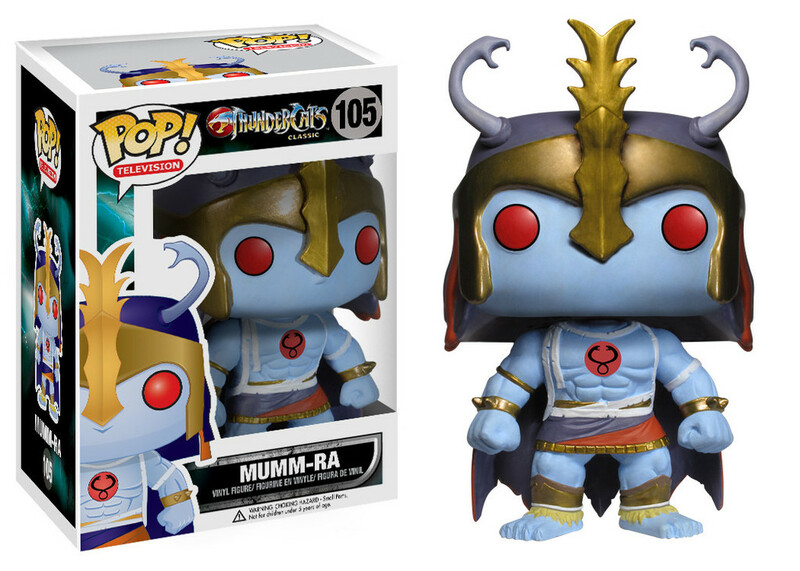 Mumm-Ra is the only figure in the ThunderCats line that hasn’t got all black button eyes. Instead he has his signature glowing red eyes! 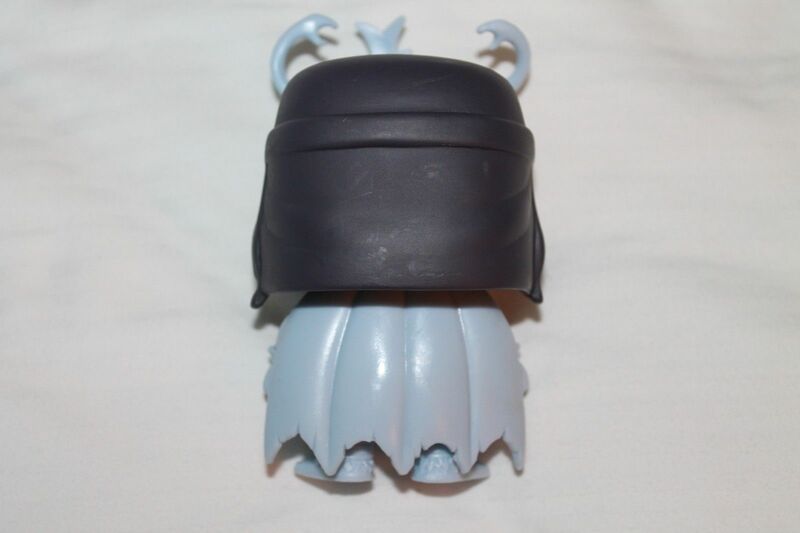 The folks at Funko even gave him little black lines around his eyes to mimic the sunken-in look of his animated counterpart! Mumm-Ra stands 3.75 inches tall and is number 105 in line. 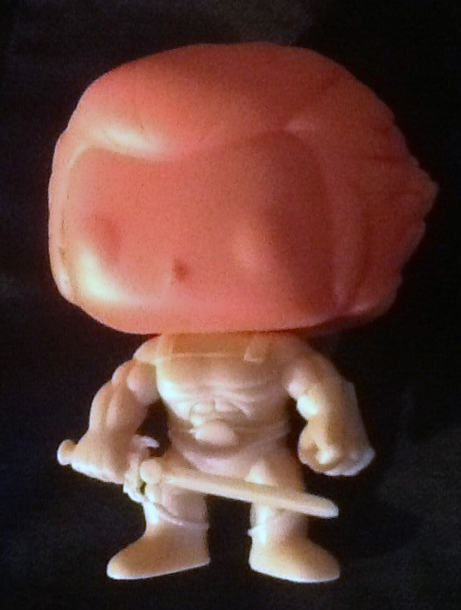 Like all other ThunderCats POP! figures, he comes packaged in a full colour, collector friendly window box. Probably the character that translates best in the chibi style, it’s everyones favorite nursemaid and squire to Lion-O, Snarf! He’s pretty cartoon accurate and looks like the nervous little critter we know and love, or not, from the classic cartoon. One thing that makes Snarf stand out from the others is that he’s the only one in the ThunderCats line with a mouth! Not a big deal, but worth noting nonetheless. 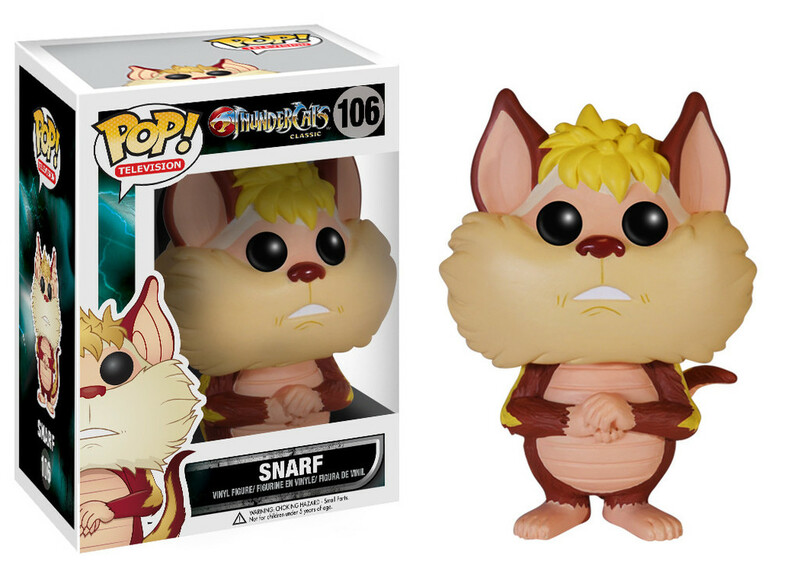 Snarf stands a massive 3.75 inches tall and is number 106 in line. Like all POP! figures, he comes packaged in a full colour, collector friendly window box. After waiting 4 years, Tygra,the highly intelligent architect of Cats Lair and the Head of the ThunderCats Council, enters the world of POP! 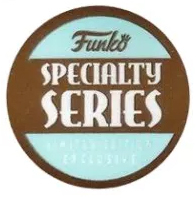 through Funko’s Specialty Series. He comes with muscles flexed and classic Bolo-whip at the ready! At 3.75 inches tall Tygra fits in perfect with the other Cats, previously released. 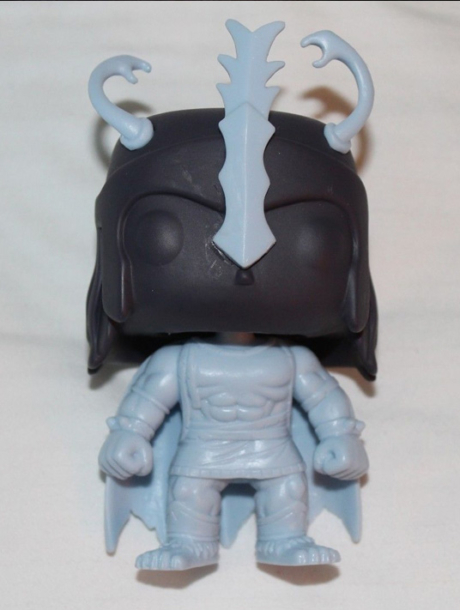 Tygra is number 573 in the POP! Television line. and comes packaged in a full colour, collector friendly window box. This Exclusive version of the hereditary Lord of the ThunderCats is basically the same as the regular release, but this one is fully flocked! Now, for those unfamiliar with the term, flocking is the process of depositing many small fiber particles, or flock, onto a surface to increase it’s value in terms of the tactile sensation, aesthetics, color and appearance. 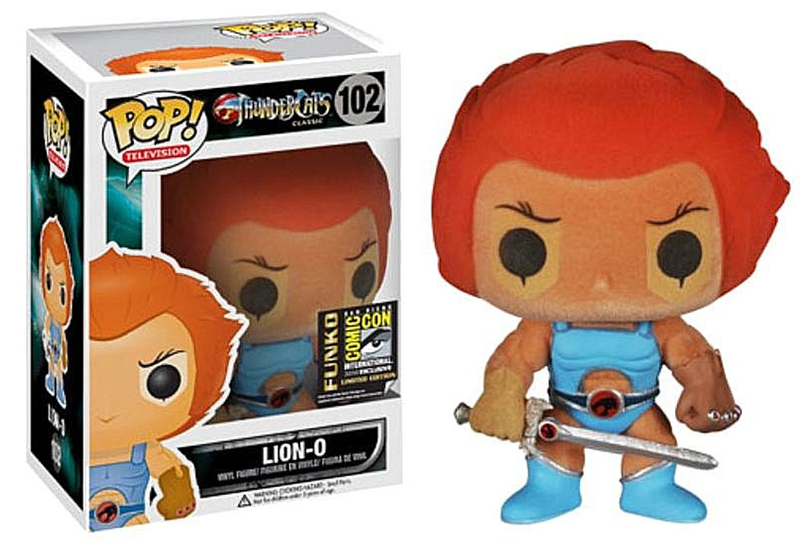 This petable little Lion-O was first brought to the fans at the 2014 San Diego Comic Con (SDCC), but there is a good chance to get your hands on one on the secondary market. This Exclusive version of the Ageless Devil Priest is the same as the regular release in every aspect, with one difference; he glows in the dark! 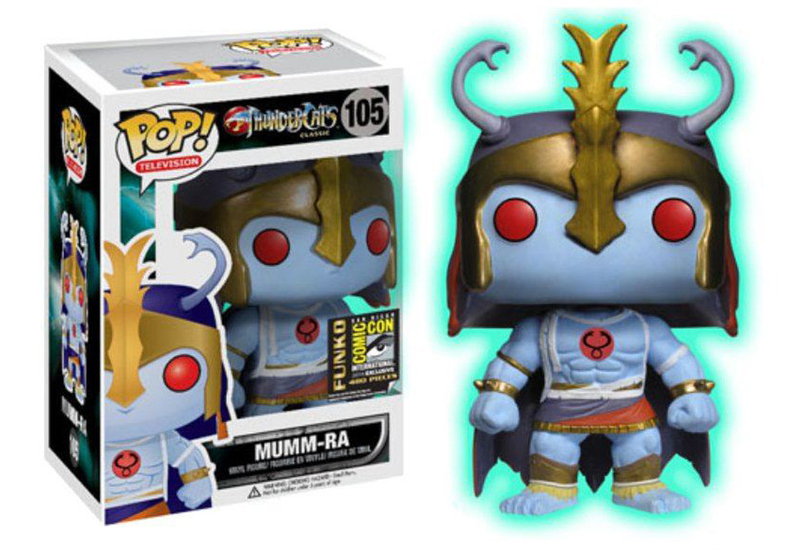 This Mumm-Ra was first brought to the fans at the 2014 San Diego Comic Con (SDCC), but there is a good chance to get your hands on one on the secondary market. Before production on these little guys begins, the factory tests the molds using any colour plastic they have available at that moment. 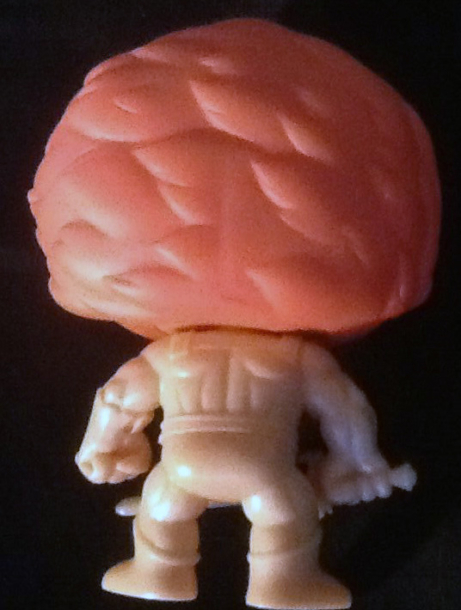 The resulting figure is called a testshot. 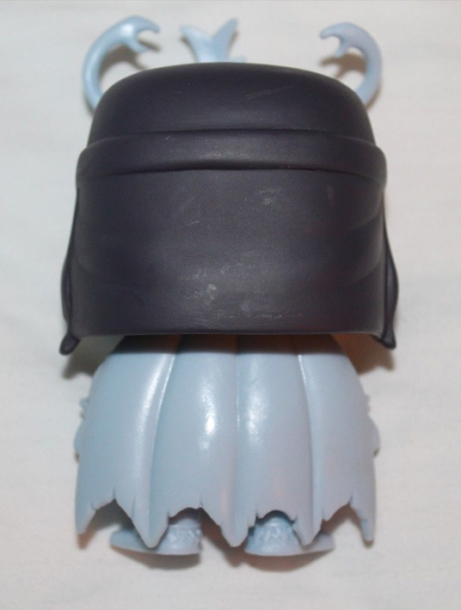 These figures are not meant for sale or distribution of any kind, but some tend to make it to the secondary market.